This past Sunday while crossing a bridge, Babe stepped into a gap in the planks and broke her leg. Babe was not with us long, but the energy that was Babe will be forever harbored in this place of one human being walking with his or her animal companions. That energy will re-materialize in the most magical of ways and be seen and experienced again and again. Babe was a shining example of how the Mules live. 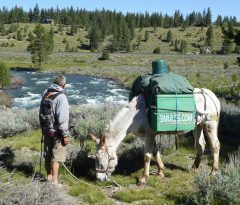 The Mules live for the magic and beauty of the Natural World until they die from accident, natural causes or stealth. Babe was diagnosed and humanely euthanized by a veterinarian. Another service picked up her body.